Today was Bike Friday, sponsored by Boston Bikes, the city office which promotes safe cycling. Bike Friday is one of the last events of Bay State Bike Week. It included a number of organized rides and a gathering at Boston City Hall. Breakstone, White & Gluck was there to share information about our Project KidSafe campaign. Attorney David W. White and Attorney Marc L. Breakstone of Breakstone, White & Gluck participated in Bike Friday at Boston City Hall Plaza. 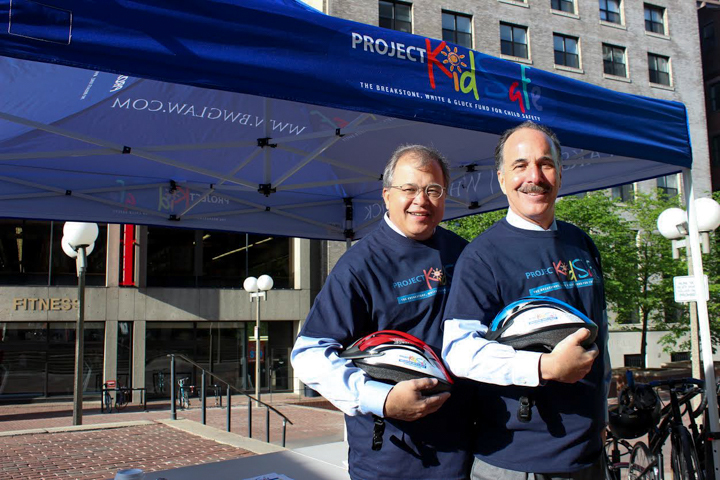 The two attorneys were there to support the cyclists as they rode in and to share information about the firm’s Project KidSafe campaign. Boston Bikes organizes Bike Fridays to celebrate those who ride their bikes to work and to encourage others. More than two dozen organizations and vendors signed up for today’s event. 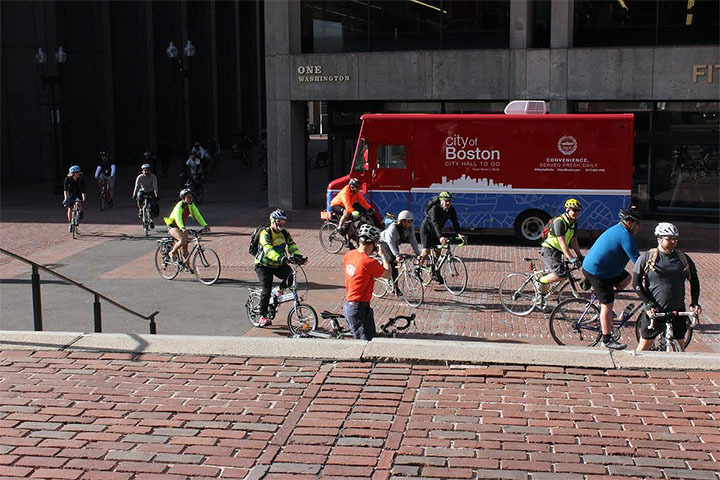 While 200 cyclists registered for the event, organizers estimated up to 350 cyclists actually pedaled in and enjoyed a free breakfast, courtesy of Boloco. Breakstone, White & Gluck participated for the first time and set up our Project KidSafe tent to show support for the cyclists. Attorneys David W. White and Marc L. Breakstone were among the crowd waiting for the cyclist convoys, which came in from Lexington, Newton, Somerville and many other communities. Other organizations which participated included MassBike, Boston Cyclists Union, Livable Streets Alliance, Hubway and Landry’s Bicycles. Marc and David spoke to a number of cyclists about our Project KidSafe initiative, through which we donate bicycle helmets to children who need one in the Boston and Worcester areas. We have donated more than 4,000 bicycle helmets since 2013, through partner organizations such as CYCLE Kids of Cambridge, Somerville and Cambridge public schools, Bikes Not Bombs, Massachusetts Safe Routes to Schools, the Westborough Bicycle and Pedestrian Advisory Committee. 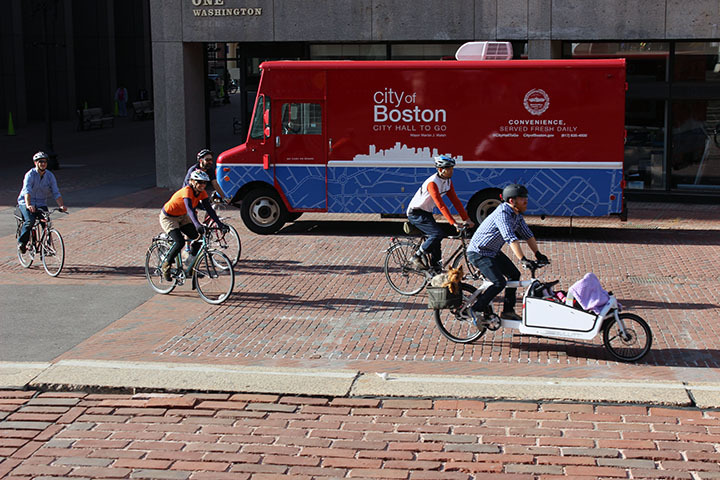 We have also worked with Boston Bikes’ Roll It Forward program, which refurbishes used bicycles and donates them to city residents who may not otherwise have access to a bicycle. The next Bike Friday events are scheduled for June 26th, July 24th and August 28th. Read more about the event. The cyclists came in in convoys this morning, traveling in from Lexington, Arlington and other communities. While 200 cyclists registered in advance, organizers estimate 350 actually rolled in. For cyclists, this is one of the best weeks of the year: Bay State Bike Week. It started Saturday and runs through next Sunday, May 17th. May is National Bike Month and Bay State Bike Week is how we celebrate in Massachusetts. This is a truly statewide event, with groups organizing gatherings, rides and photo exhibits throughout Massachusetts. 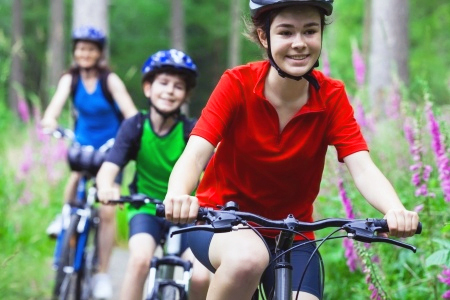 These events are a great way to learn about cycling in Massachusetts, as well as safety. There are some groups working hard to prevent bicycle accidents in our state and this is the time to see their work. Bay State Bike Week is a partnership between the Massachusetts Department of Transportation (MassDOT), MassBike and MassRides. If you are a cyclist, check out the list of events. Here are a few events of note. Watch for us! We may be participating in a few. Cambridge. This will be a busy week in Cambridge, with a wide range of events, from pancake breakfasts to lunches with the Cambridge Police Department and city planning staff, where cyclists can ask questions. On Saturday, cyclists gather for a two-hour ride in honor of the late talk host Tom Magliozzi of Cambridge, who was best known for hosting Car Talk on NPR alongside his brother. There are also bicycle maintenance workshops throughout the week, where cyclists can take home a few tips for free. Waltham. 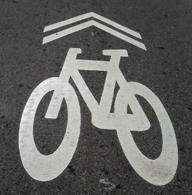 Waltham is hosting its Second Annual City of Waltham Bicycle Update on Wednesday at 6 p.m., at the Government Center Auditorium on School Street. With more than 60,000 residents, large employers and colleges, the city is looking to encourage safe cycling as an alternative form of transportation. Lexington. Free bike safety checks will be offered throughout the week. On Friday, a light breakfast is free on the Minuteman Bikeway, near the Lexington Depot. Then Richard Fries, executive director of Mass Bike Director, will lead a bicycle convoy from Lexington to Boston City Hall. Bike Friday at Boston City Hall. On Friday, the commuters will ride in from all over for Bike Friday, where they are rewarded with a free breakfast. This is a popular event organized by Boston Bikes. It is held once a month in the summer and will be one of the last events of Bay State Bike Week. Attorney David W. White will be out with our Project KidSafe tent as the cyclists pull in. Somerville Bike Day. For the third year, we will join the Somerville Kiwanis at the city’s annual Bike Day at Argenziano School on Washington Street. We will donate 120 new helmets and help fit the helmets for the children. Children will receive a free bicycle inspection, reflectors, and safety pamphlets and get to test their skills on a bicycle obstacle course. The Somerville Police Department will be on hand to register bikes for children. Western Massachusetts Events. There will be commuter breakfasts, mayor’s rides and photo exhibits in Westfield, Amherst, Springfield and Northampton. Cape Cod Events. There are several rides and interesting events in Cape Cod this week, but one of note is the Cape Cod Summer Citizens – Bike Safety Outreach Program. Each year, thousands of international students arrive on Cape Cod to arrive in work and travel programs. They primarily have to travel on bicycles and this program starts this week. This program provides education to all cyclists throughout the busy tourist season.